A console table is so much more than just a storage surface. Think of a place or lonely spot in your home and imagine it filled with this sleek console, along with flowers, family photos and your favourite ornamental pieces. It's a much better way to make use of the space! With the Calanna Grey Oak Console Table, you'll be able to make use of the space you have available while adding such a sleek and designer look that will radiate throughout the rest of your room. 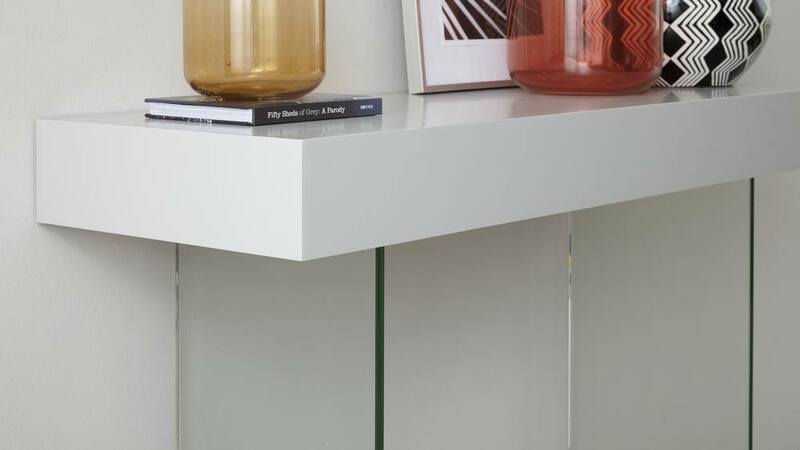 The placement of the legs on this modern console means that from the front it has a clever floating effect, almost creating the visual illusion of a floating shelf. The thickness of the top balances the legs so that it has a really light, minimal look but still with some substance. 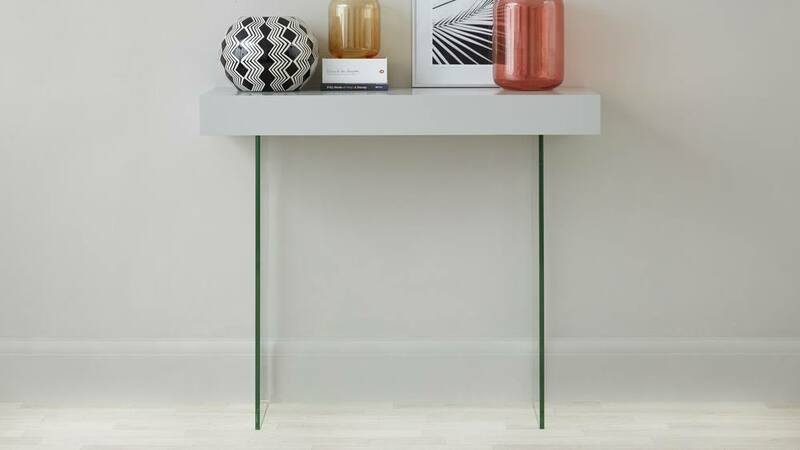 The glass legs allow this console to be placed in a whole variety of different schemes due to its simplicity. 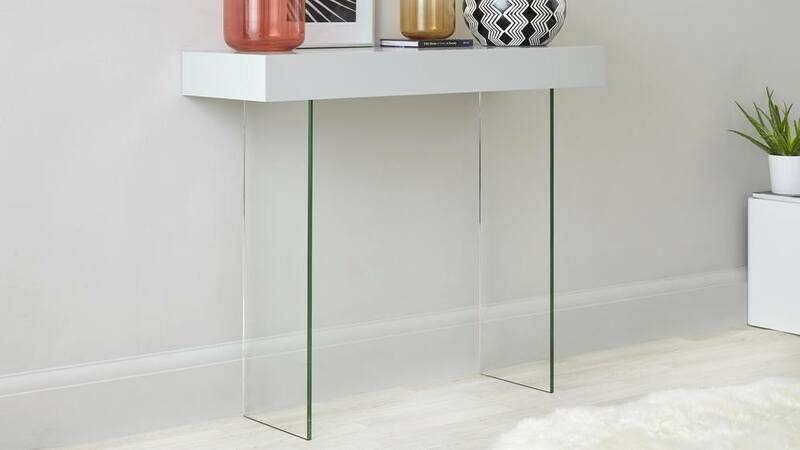 Glass looks just as good styled alongside a coloured wall or patterned wallpaper as it would by a lighter painted wall, meaning you really can style this console to your heart's content! The glass we use for the legs of the Calanna is a tempered safety glass which has been rigorously tested for its strength and durability. It's one of the strongest surface materials you can have in the home, so you really needn't worry about the glass support or it being fragile around young children. 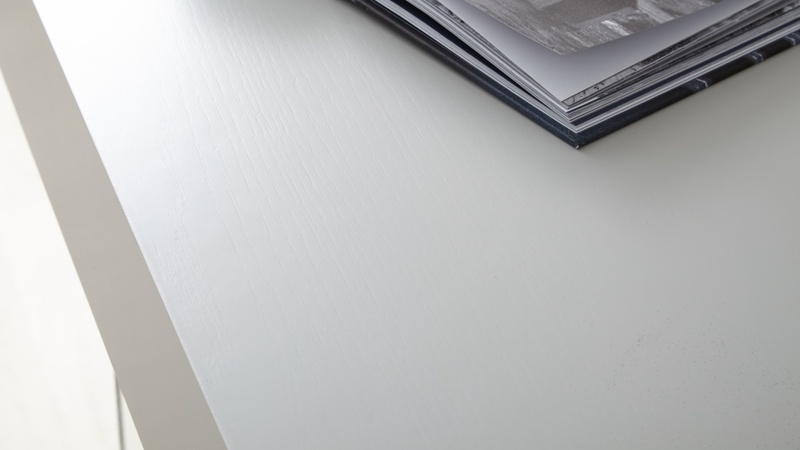 Grey oak will bring a hint of warmth to your space due to its colour and the textured quality of its wood grain. Oak veneer finishes are much less reflective than gloss, making it a great alternative to having a bright, glossy finish in your home. The combination of grey oak and clear glass is such a stylish pairing. The transparency of the glass creates a spacious and open feel, while the grey oak adds a warm, tactile and designer look. The grey oak top will create more of a visual impact in the space, especially alongside the clear glass legs, creating the potential for coordinating the table with other pieces in your existing interior. If you love the look of the Calanna but are after a different finish to coordinate with your space, we also have the Calanna White Oak Console Table and Calanna White Gloss Console Table available, all part of the Calanna Range.